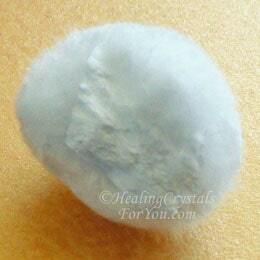 Okenite are unique white crystals that have a quite beautiful shape and form that looks a little like a cotton ball. 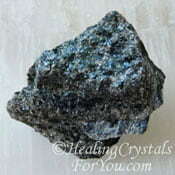 This unusual mineral has metaphysical properties that support you to be more truthful and their energy may also help you to be more gentle in your way of speaking the truth. They are known as stones of karmic grace that help you to release any negative energy related to karmic events still held in your energy field from past lives. These unusual stones are beneficial when used at any chakra, aiding self forgiveness and clearing guilt... to aid the cycle to complete. The healing properties of crystals like these are particularly helpful to assist disease that is related to aging, as well as having a number of other useful purposes. 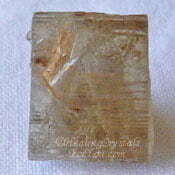 The meaning of the name of this crystal relates to it being called after the German naturalist Lorenz Oken, spelled Ocken in his mother language. Therefore it was first called Ockenite, but was later changed to the current spelling. This mineral is found in a number of locations including in New Zealand, Ireland, the Faroe Islands, Greenland, Iceland, India, Chile and in the USA. 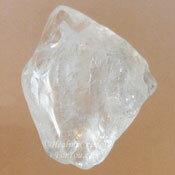 This mineral is often reported to be a type of zeolite, but although it may be found in the same places as many zeolites it is not a zeolite mineral. 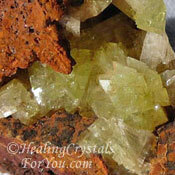 Minerals that occur alongside this stone include Apophyllite, Gyrolite, Goosecreekite, Chalcedony and Prehnite. 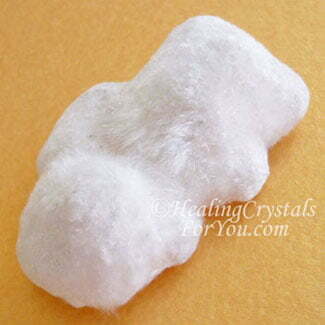 This mineral is quite unusual as its formation looks a bit like a furry fuzzy snowball. Their mineral form is fibrous, fine-bladed and lath like. They have a straight, radiating and fibrous form, with the fibers being so closely interlaced to make them appear to be a little like a cotton ball. Although it looks interesting, it may take some thought about how to work with it, due to its unusual structure, and its fragile nature. Many pieces are sold in a container, which is useful to aid you to use them without a breakage occuring. 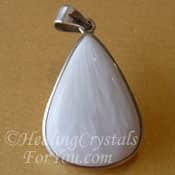 Please note that their color is white, even though there are fake colored pieces of this stone labeled with the same name that have been selling. The colored stones are fakes! Why Would You Use Okenite? 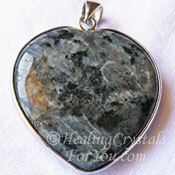 Okenite is known as a stone of karmic grace. Not everyone knows about what the meaning of karmic grace is, as it is a quite tricky concept. So lets first think about the meaning of karma. Karma is generally related to the receiving of either punishment or reward for the good or bad deeds done while on earth. Those who believe in karma expect that each life that is lived on earth plays out according to how you have acted in a past life, and that you return to earth to resolve karma where necessary. So how does karmic grace work and what exactly is the meaning of grace? The spiritual definition of the word Grace relates to gaining forgiveness from Spirit regardless of whether you deserve it or not. So when you think of karmic grace, this is therefore saying that although you might have past situations that might have created karmic debt that needs resolving, the addition of grace means that you do not need to do anything to resolve the debt. 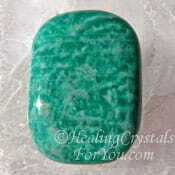 The energy of these crystals can help you to recall past situations and work out what the life lesson was behind all of the events that played out. 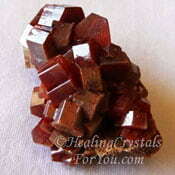 The powerful vibration of these crystals also helps to stimulate self forgiveness. By their action to help you to forgive yourself for what you did in the past, either in this life or a prior life, it can ease any guilt you might be feeling. This can allow the event to be released, which may aid you to finalize the cycle of karmic events that have brought you to where you are in this life. 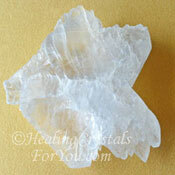 These white crystals also help to purify all or any of the chakras, on all levels within the etheric body. 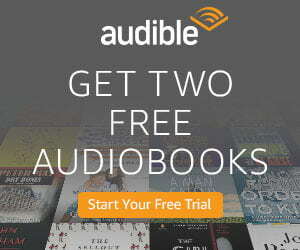 How Will Okenite Help You? 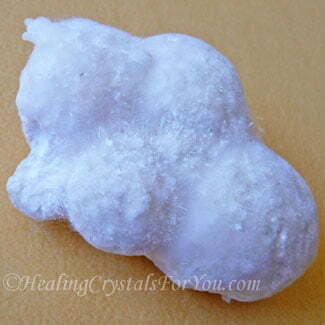 These unusual white fluffy stones are known for their action within both the crown chakra and the soul star chakra, a highly spiritual area located above the crown chakra in the etheric body. Their resonance within the crown chakra may stimulate your abilities to channel spirit and make a connection with those who have passed over, also known as mediumship. 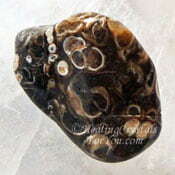 These stones are also said to aid you to receive information related to ancient sacred texts. They are known to aid you to move forward in your life, without being blocked or deterred by perceived barriers that may be preventing you from achieving your desires. 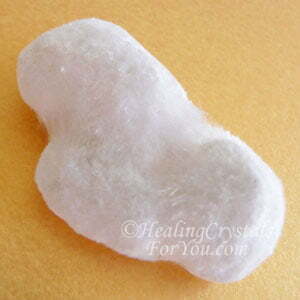 They are said to aid the release of thoughts that may be creating an impediment to your carrying out future plans. 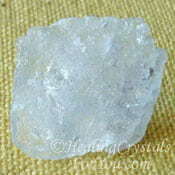 These crystals are also helpful to assist you to release puritanical or straight-laced attitudes that could relate to past life situations where vows of chastity may have been taken. The vibration of these stones also aids you to tell the truth. They have a strong action to assist you to be very aware of what truth means, and to accept that what others feel is the truth is only their truth. 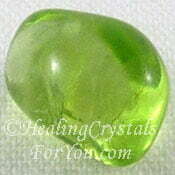 These stones also aid you to be aware that others truth does not have to be accepted by you unless its your truth. The energy of these crystals helps you not to feel distressed by others way of verbalizing what they believe, especially when what they say is the opposite of what you believe to be true. These crystals are known to have a number of useful healing properties and are particularly useful for breast-feeding mothers to use. They are said to be useful for new mothers to use because they support the flow of blood to the chest area, which may help the flow of milk for nursing mothers. By aiding you to feel more calm and peaceful about the situation, their energy is also known to be helpful to assist you if you are an invalid who has had an enduring illness and are distressed by the time it has taken to heal. 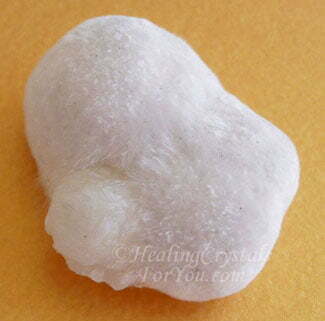 These crystals are particularly useful to aid health issues related to aging and are said to enhance the healing of inflammation and may assist the pain of sprains and strains. They may help the healing of fevers, and are said to assist a nervous stomach. Make them into an elixir using the indirect method, to use to aid skin problems to heal. "How people treat you is their karma; how you react is yours." Wayne Dyer. 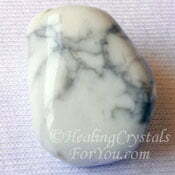 You may wish to use these white stones if have a need to deal with a situation where it is would be beneficial to be aware of the meaning of truth. 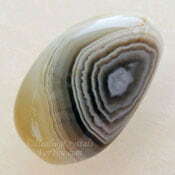 If you wish to increase the level of energy that may assist you and others to speak truthfully use them with other stones that also resonate with an energy that encourages truthfulness. 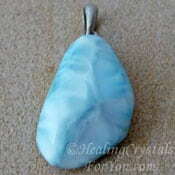 Stones for this purpose includes Shattuckite, Lapis Lazuli, Amazonite, Goshenite aka White Beryl, Turquoise or Sunstone. 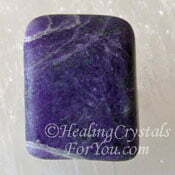 These stones have a good energy within the crown chakra to stimulate channeling and may aid you to connect with the spirits of those who have passed over. 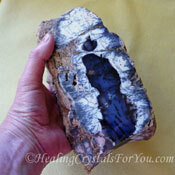 If you wish to increase your ability to channel information from the other side, use them with other stones that may also encourage channeling. Some of the other stones that may help with this includes Pollucite, Adamite, Spurrite aka Titanite, Shattuckite, Yttrium Fluorite, Merlinite or Sugilite. 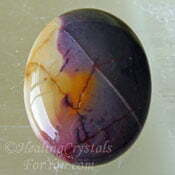 These stones have a good energy to stimulate the crown chakra, and while using them alone is highly beneficial if you wish to boost the way that they work, use them with other stones for this chakra. Stones you might choose includes crystals such as Selenite, Larvikite, Diaspore, Botswana Agate, Novaculite, Beryllonite or Colemanite. 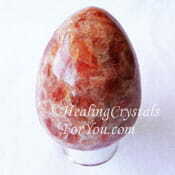 To assist health issues associated with aging there are a number of other stones that may help you, including Mookaite Jasper, Augite, Peridot, Turritella Agate, Maori Greenstone, Phosphosiderite, Tunellite, Sillimanite or Vanadinite. If you specifically feel the need to feel relaxed and peaceful, you may choose to use these crystals with others that help to maintain calm and that will soothe you. You could use them with other calming stones such as Holmquistite, Larimar, Lilac Lepidolite, Lithium Quartz, Howlite, Tiger Eye, Rose Quartz or Scolecite.